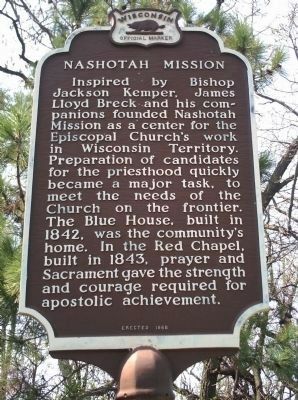 Inspired by Bishop Jackson Kemper, James Lloyd Breck and his companions founded Nashotah Mission as a center for the Episcopal Church’s work in Wisconsin Territory. Preparation of candidates for the priesthood quickly became a major task, to meet the needs of the Church on the frontier. 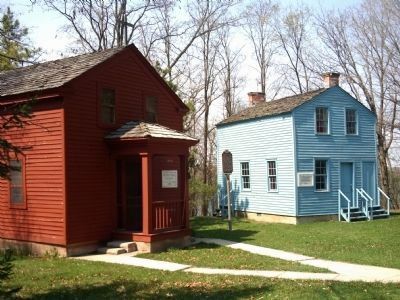 The Blue House, built in 1842, was the community’s home. 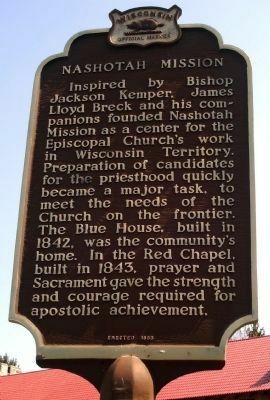 In the Red Chapel, built in 1843, prayer and Sacrament gave the strength and courage required for apostolic achievement. Location. 43° 4.914′ N, 88° 25.613′ W. Marker is in Delafield, Wisconsin, in Waukesha County. Marker can be reached from Mission Road half a mile from Mill Road. Touch for map. Marker is located behind the main administative building at the mission. Marker is in this post office area: Delafield WI 53018, United States of America. Touch for directions. Cushing Memorial Park (approx. 1.6 miles away); St. John's Military Academy (approx. 1.6 miles away); Northwestern Military and Naval Academy (approx. 1.6 miles away); Delafield Fish Hatchery (approx. 1.8 miles away); Hawks Inn (approx. 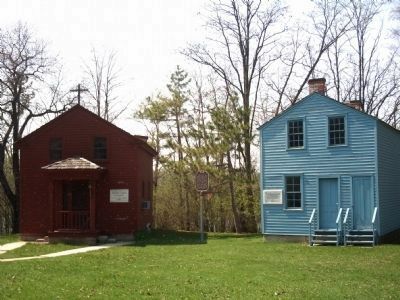 1.8 miles away); Historic Okauchee (approx. 2.2 miles away); Lapham Peak (approx. 3.8 miles away). Touch for a list and map of all markers in Delafield. More. Search the internet for Nashotah Mission. Credits. This page was last revised on June 16, 2016. This page originally submitted on June 2, 2010, by Paul Fehrenbach of Germantown, Wisconsin. This page has been viewed 812 times since then and 18 times this year. Last updated on July 2, 2010, by Paul Fehrenbach of Germantown, Wisconsin. Photos: 1, 2, 3, 4. submitted on June 2, 2010, by Paul Fehrenbach of Germantown, Wisconsin. • Kevin W. was the editor who published this page.